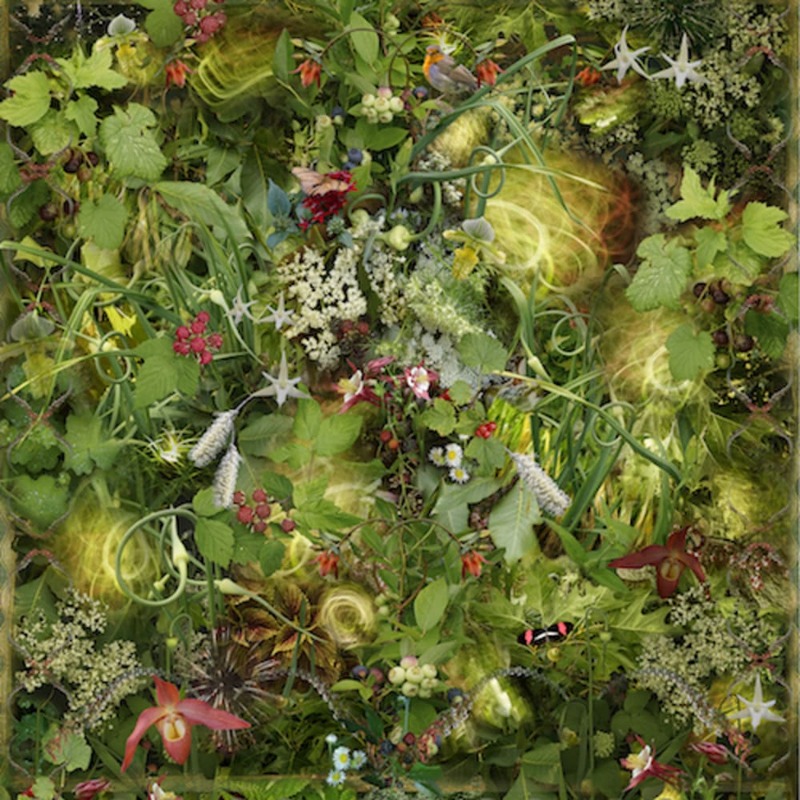 Lisa A. Frank’s large-scale photographs are kaleidoscopic multilayered images of the natural world. The work’s complex patterns are composed from the artist’s deep archive of her own photographs; the images are digitally collaged and arranged in patterns that take cues from historic wallpaper designs. Densely ornamental, the work draws upon the artist's background as a textile designer as well as the interior decoration documents of Britain’s Aesthetic Movement of the late 19th century. The artwork is presented in several different ways: as solitary repeating patterns, as stand-alone tapestry-like designs, and as floor to ceiling Specimen Panels that combine repeating patterns with elaborately constructed trompe l’oeil mouldings that include wainscoting, friezes, borders, swags and other architectural detailing. The ability of these patterns to endlessly tile creates the potential for multiple sized works ranging from large individual prints to full room installations. Frank’s artwork is connected to the “wildness” in nature even as she is taming it by the creation of formal compositions. In addition to her fine art, Frank has designed textiles, wallpaper, and surface treatments for residential and commercial interior projects. The artist was awarded the MacDowell Colony’s Evelyn Stefansson Nef Fellow in photography. Frank was a Senior Research Fellow at the Beckman Institute for Advanced Science and Technology at the University of Illinois Urbana-Champaign. She was the first artist/collaborator to be given this distinction. At the University of Wisconsin, Frank is currently part of the Discovery to Product (D2P) incubator program, through which she is developing virtual reality content based on her two-dimensional photography. Frank has a MFA in Design Studies from the University of Wisconsin and has completed extensive graduate work at Yale University, New Haven, CT, and School of Visual Arts, New York, NY. The artist lives and works in Wisconsin.